Special exhibit of Rembrandt at Rijksmuseum was a welcome surprise. The collection and display of his art was enhanced by a knowledgeable tour guide. The Van Gogh exhibit, again, was a large and wonderful collection. The tour guide provided the background and special qualities of each painting and of the artist's life. Got quite a lot of information from our guide who is an Art Major. I would’ve preferred a little time to export on our own. Lunch was very nice. Would’ve preferred the canal ride AFTER the museums to allow more museum time. Although there was more walking than I expected, the overall experience was wonderful. Monique was the best - very informative, quick witted and entertaining in a such a way to keep you interested. 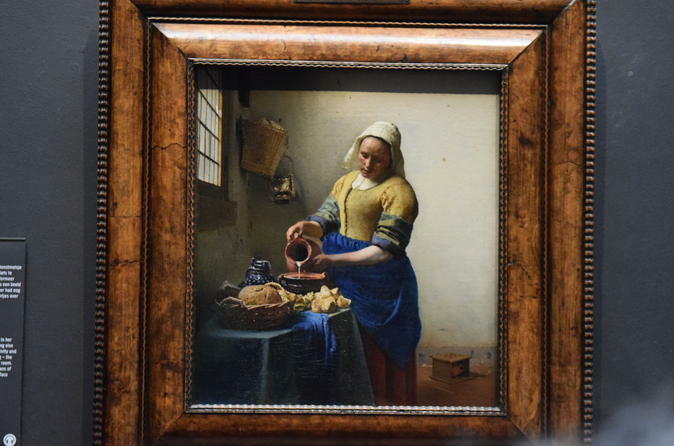 Her enthusiasm for art in general and the museums drew you into the history of these artist, especially Van Gogh. I was very disappointed by this tour. My booking confirmation stated this tour was in English only. Unfortunately it was bilingual . The need for repetitive translation dragged out the tour and limited the time we had to view the marvelous works of art. My next complaint may sound unfair, but the guide had a sore throat that made it more difficult to understand her in the noisy surroundings. The point is that she shared that this raspiness had been going on for weeks. You’d think in that period of time they could have found a replacement. I’ve used Viator many times with generally good success but this really bothered me especially since the tour that was promised wasn’t delivered. Elsa was so knowledgeable about both museums. I learned so much from her many insights. Everyone on my tour enjoyed this immensely. We were lucky to have Michael Doggen guide us through the Rykes and Van Gogh museum. His breadth of knowledge about art history in general, and the Dutch masters in particular made our museum experience all the more meaningful and interesting. Michael provided historical context for the artwork, explained various painting techniques and styles and really helped us to understand the significance of pieces such as Rembrandt's Night Watch. I don't know whether all of the guides are as know and talented as Michael but I can tell you that touring the museums with Michael was one of the highlights of time in Amsterdam. Don't book this tour for the canal tour or the museum lunch - both were underwhelming at best. The museum piece, however, was totally worthwhile based upon our experience with Michael Doggen. 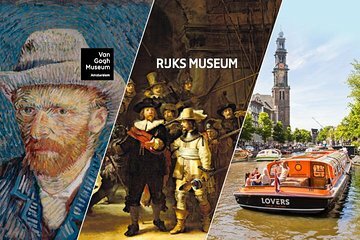 If you have only one full day in Amsterdam, as we did, we highly recommend taking this tour, especially for the Rijksmusem and Van Gogh segments. Tour guide Pieter is incredibly knowledgeable and enthusiastic about the artists and the styles of their times. He has a sense of humor that makes a long day more enjoyable. The canal cruise went by the Anne Frank House, and Pieter provided information about the life of her and her family. Lunch at the Rijksmuseum was a tasty soup and sandwich, perfect for the day as it was not too heavy and did not take much time away from the museum tours. The lunch also accommodates those who need a gluten free meal. Following the end of the tour, we walked from the Van Gogh back to Centraal Station, an enjoyable way to end the afternoon. Michael was our guide and it was if he was an art instructor. He did a fantastic job. The canal tour was an added plus. The lunch at the Rijksmuseum was very good. Beautiful walking tour on August 17, 2018 lead by tour guide, Michael. He was a very knowledgeable guide and was extremely personable as well. We really enjoyed it!